I enjoyed processing this photo the most, so I thought I’ll reprocess the same and this time, write a blogpost on how I did it, so that the strange techniques I use may be available to others. I’m going to avoid explaining details on how to do small operations with The GIMP, which is what I’m going to use here to process this photograph. The GIMP is free and open source software and can be downloaded for both Linux and Windows. It is highly recommended that you encourage and use Free and Open Source software. 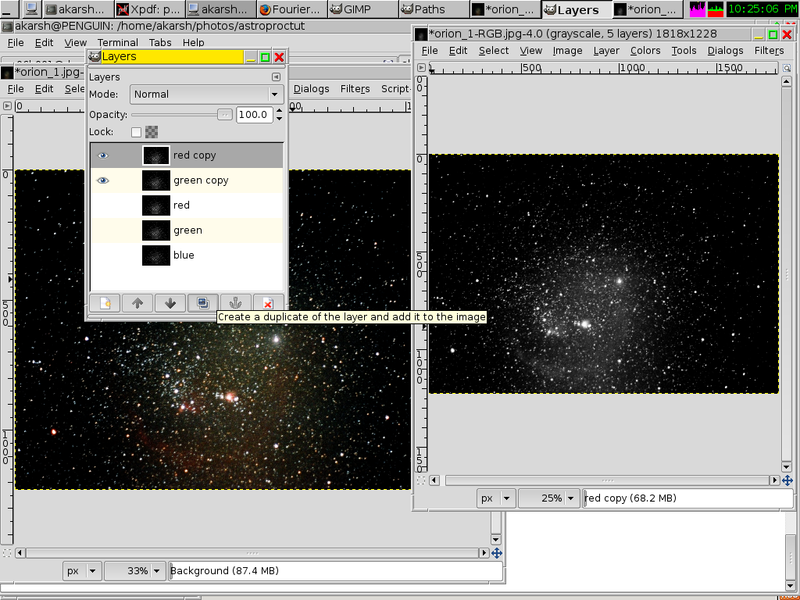 The GIMP can do most of the things that a copy of Photoshop costing 30k Rupees for free, and much more! Step 1: Set your monitor contrast and brightness to a good amount. See Jerry Lodriguss’ page on how to do this professionally. I do it randomly to my satisfaction :-P. This is important, because the last time I processed this, the outcome was good looking at my low contrast (which I use to protect my eyes) but it looked really artificial and ugly at high contrast. Step 3: We now set the black point. Go to Colors -> Levels (Layers -> Colors -> Levels in older versions) and click on the ‘pick black point’ button. 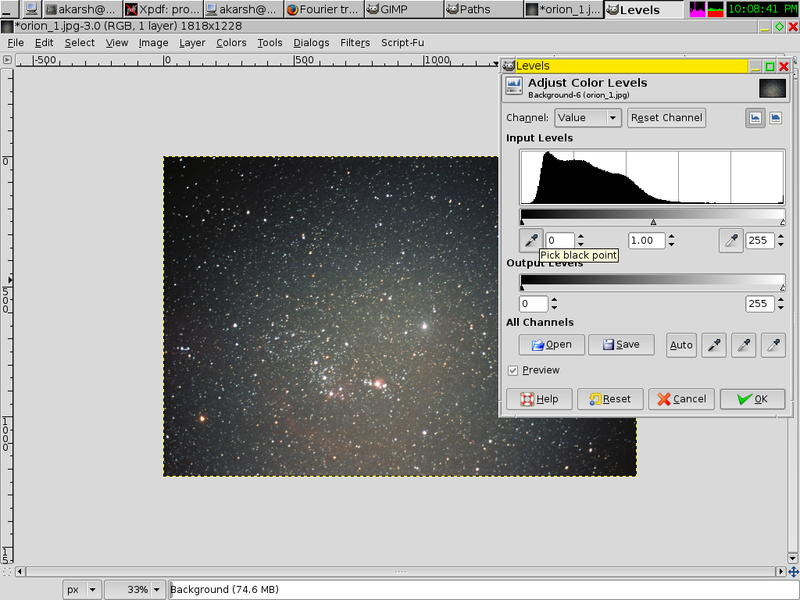 Then, select a point on the image that corresponds to the skyglow in the image. Because of vignetting, the skyglow is not uniform, so I chose a point where it is somewhere inbetween, so that I don’t lose faint stars, but still cut out enough skyglow. Step 4: Adjust curves to improve the photo. 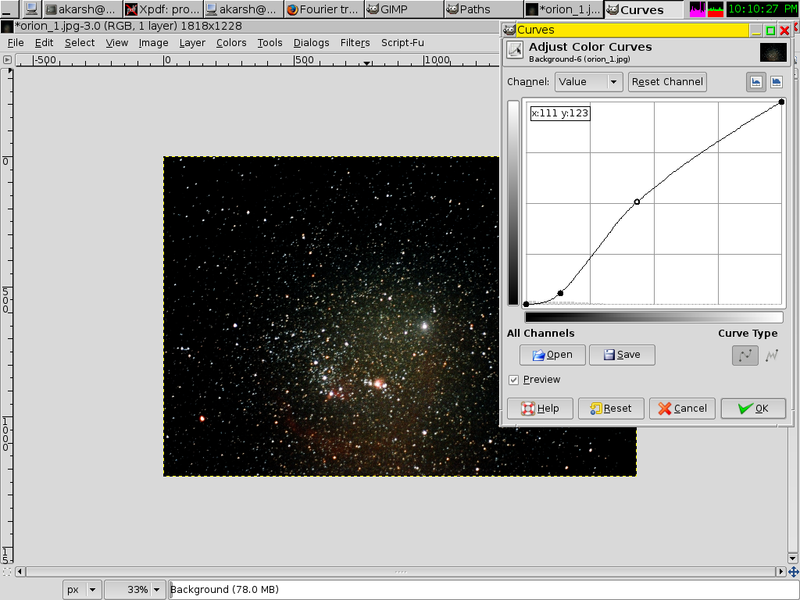 The Curves tool is found at Colors -> Curves (Layers -> Colors -> Curves in older versions). Enhance the useful details and kill the noise. Of course, be careful to preserve the fainter stars as well. Don’t try to supress all the noise – you’ll lose the nebulosity. 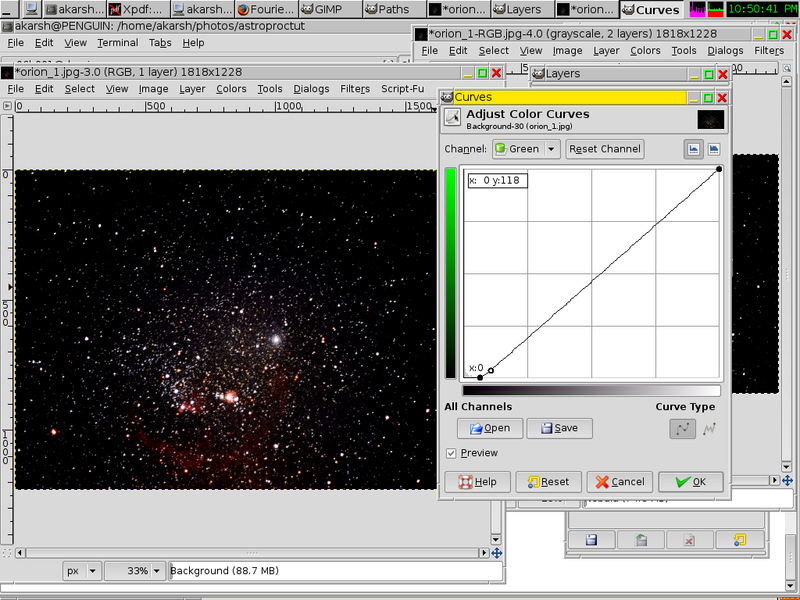 Step 5: Decompose the image into Red, Green and Blue Channels. To do this go to Colors -> Components -> Decompose and choose RGB. 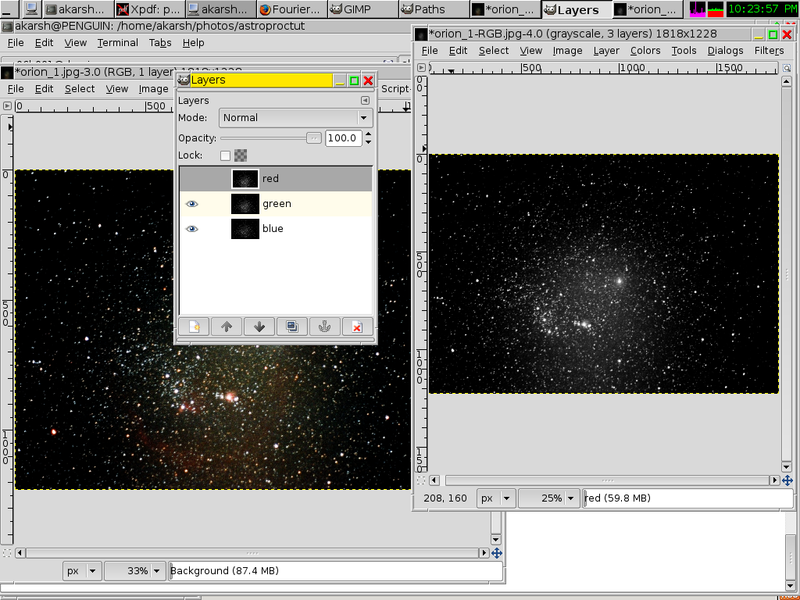 The GIMP will open a new window with a grayscale image. 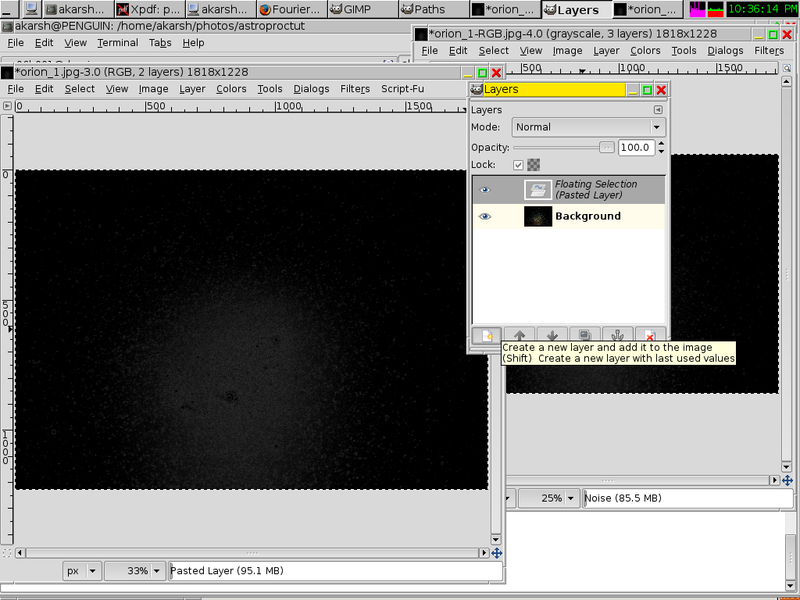 If you fire up the layers dialog, you’ll notice that it has the R-G-B channels as separate layers. So we can work on each channel just as we would work on a layer. In this screenshot, the Red Layer is shown. 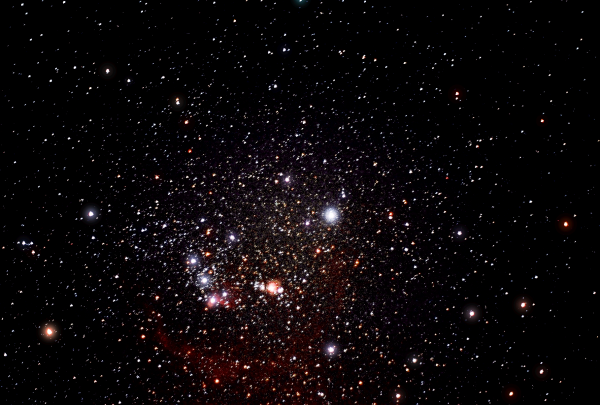 Notice that the nebulosity is strong in the red channel because of the Hydrogen emissions. Step 6: Find the noise. It involves some thinking to decide how you will catch only the noisy skyglow and remove the sensible parts of the image. In the case of this example, the noise was mostly in the Red and Green channels, so I could use some combination of them to extract only the noise. I found that I could do that best by doing a “Grain Merge” between the Red and Green layers and subtracting that from the Green Layer. Then, merge the layers (Ctrl+M) and use the Curves tool and the Eraser / Paintbrush tools to eliminate all part not noise. You may then copy the noise layer and paste its of the image that are into the original colour image. (Remember that we were working on the decomposed grayscale image till now). In the Layers dialog, that will appear as a ‘floating selection’. Click on the ‘Create new layer’ button to make it into a new layer. Step 7: Colorize the noise using the Channel Mixer (Colors -> Components -> Channel Mixer). Give the grayscale noise layer that we pasted in the previous step a hue of the colour of the noise in the original image. In the case of this photo it was yellowish-green. So I went to the Channel Mixer and raised the intensities of the contributions to red and green channels. 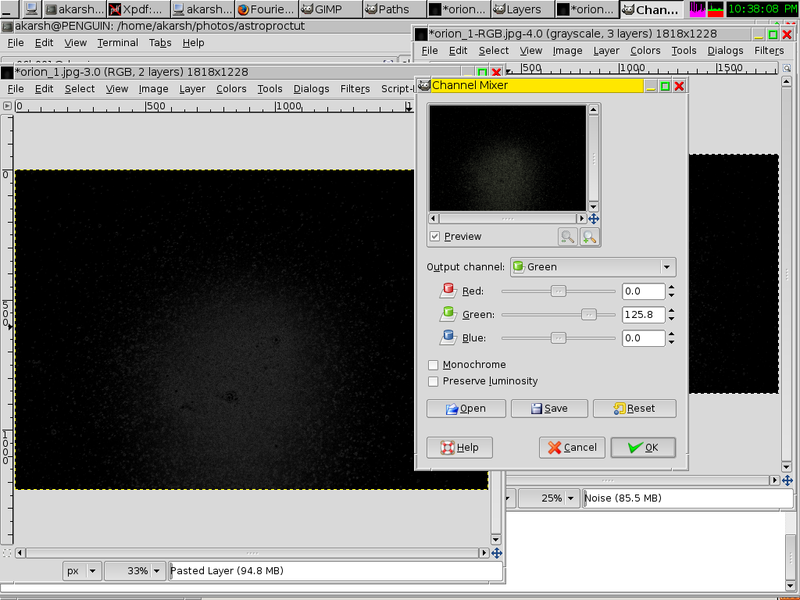 Step 8: Set the layer mode to subtract, to subtract the noise from the image. It gives a real nice feeling to see that skyglow vanish! It was worth the effort, wasn’t it? Step 9: You may want to enhance the nebulosity by adding that over again to the photo. Go back to the decomposed image and subtract the noise from the red channel. 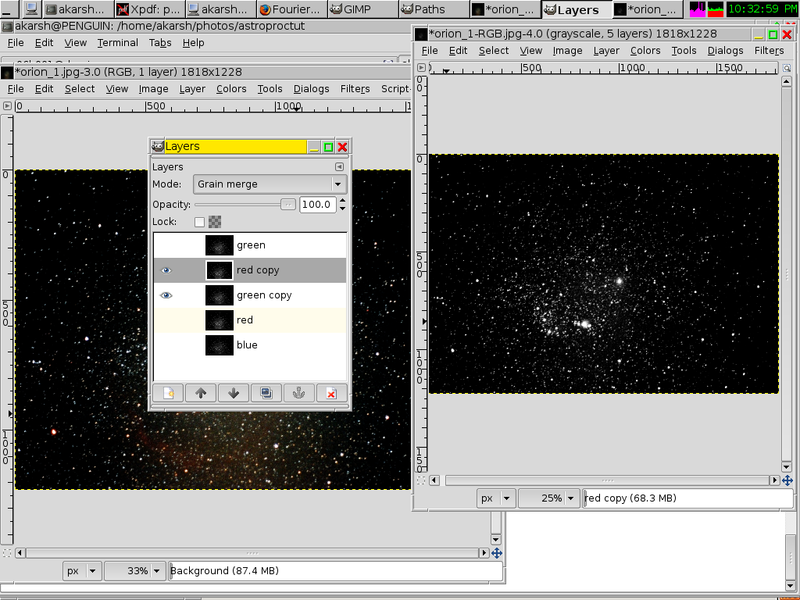 Then combine the layers, copy, paste into the main image. 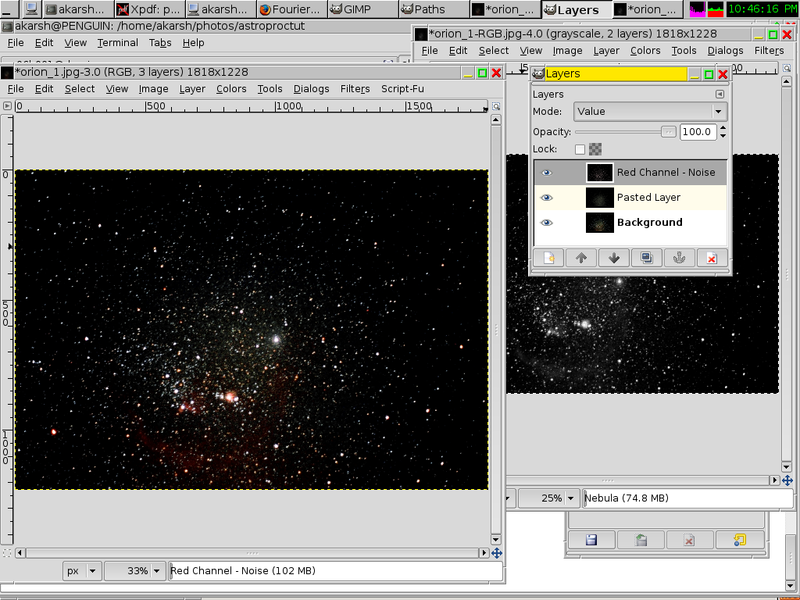 Again, convert the floating selection into a new layer, colorify the nebula with a red tint using the Channel Mixer. Change the mode of the nebula layer to value and the nebulosity will increase. 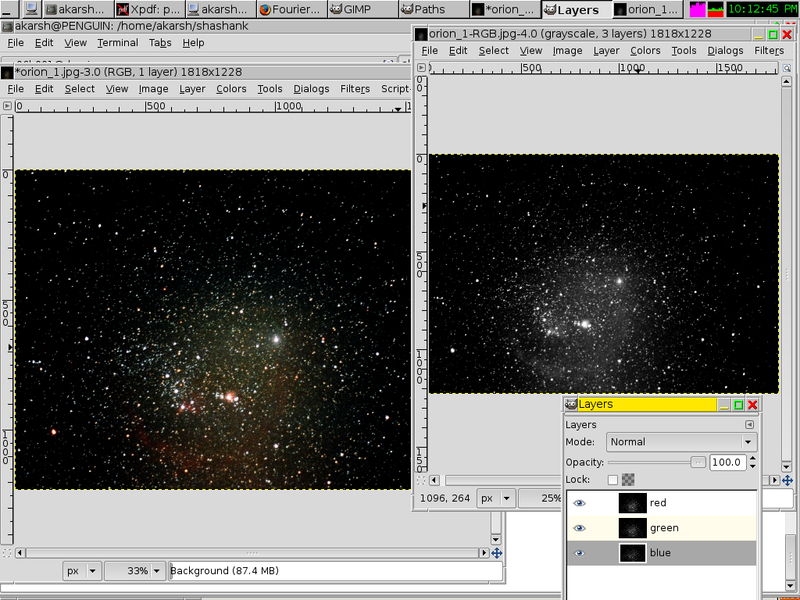 Step 10: Now, merge the layers (Ctrl+M) and if required adjust curves to do some final adjustments. I had some more greenish skyfog, so I killed that by adjusting the curves for the Green channel. I also tampered with the curve for the value channel to improve contrast. Step 11: If you like, (I do!) you may want to give the diffuse stars effect by using Curves and Gaussian Blur (Filters -> Blur -> Gaussian Blur) repeatedly. To do this, first duplicate the image layer and blur it with a radius of about 20 px. Then use curves to kill all the fainter stars. 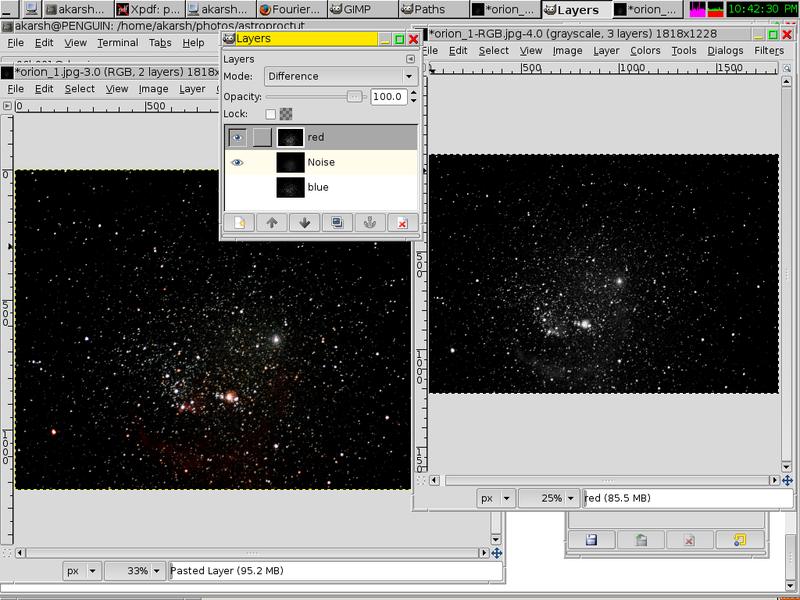 Again, use blur to increase the diameter of the bright stars. Repeat till you are satisfied. If required (I had to do this) make colour adjustments by adjusting curves of individual channels as well. 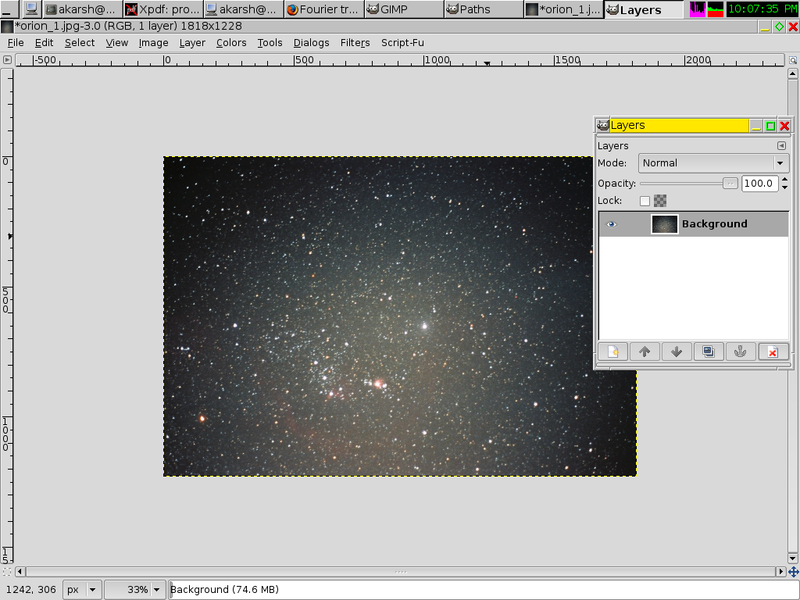 Once you get nice halos of bright stars, change the layer mode to screen. I also had to kill the blurred halo of Orion Nebula while doing this, to preserve detail. Shashank has really done a great job in taking this photo. This is a long exposure (> 10 minutes. I don’t know the details) manually tracked photo. Shashank does a very good job with manual tracking for the kind of equipment he has. 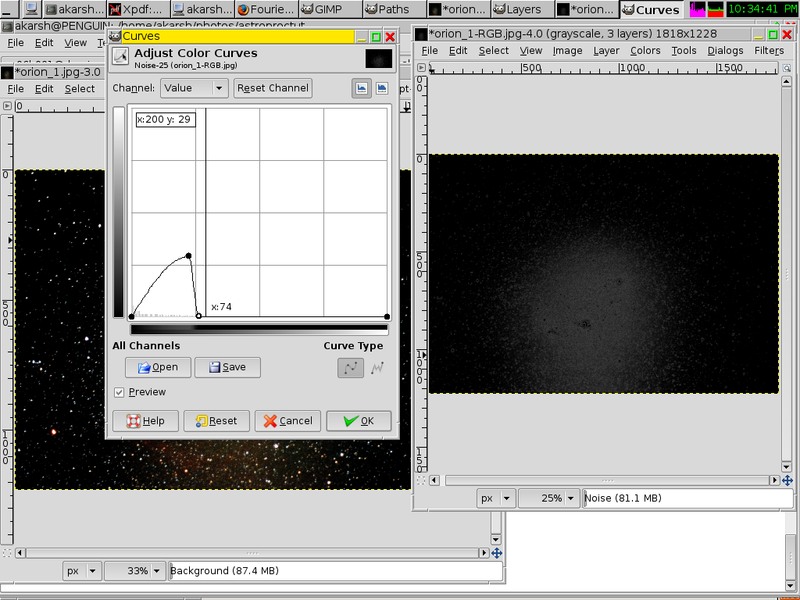 You can also see the stars of Lepus highlighted by the diffuse stars effect. 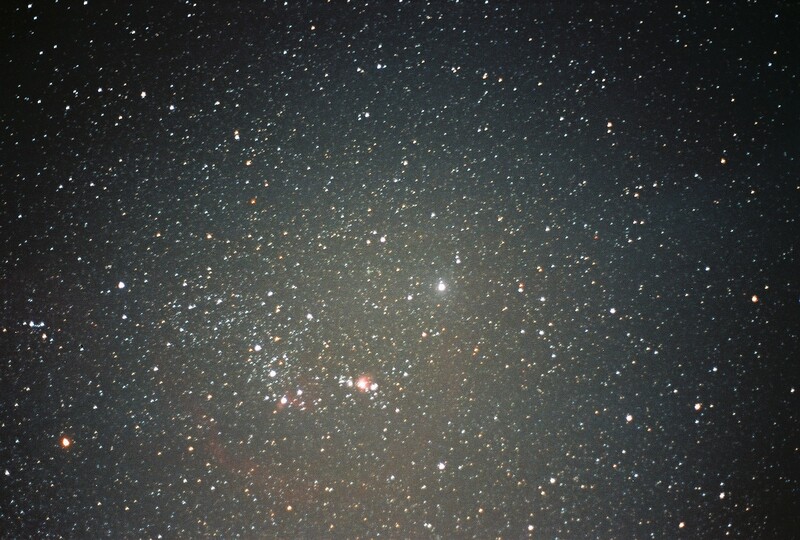 You can see the Flame Nebula,IC 434 emission nebula, Great Orion Nebula and Barnard’s Loop. If you want to get even more out of it, you can create a sort of fake flat frame where you create an image with that vignette area as a white fuzzy snowball and then you can have a better black point to get rid of skyglow. I’ll bet there’d be even more detail in there that way. Good job, though. Ahh… yes. I think I understand what you mean. I’d tried that earlier sometime and it worked pretty well. I thought that the noise extraction from the decomposed image would remove that as well. just do some searching on Google on how to take a good flat frame – you can create one yourself (it’s not as good, but better than nothing) and the results will really surprise you – there’s even more data in there than you think! Flats are taken to remove the vignetting in a picture.Flats are taken at ISO 100 ,with t he focus and the position of the camera SAME as the subs. The histogram on the back of the camera should read between 1/3 to 1/2 ( adjust the timing).Pic is shot in the evening sky with scope pointing east .Normally 9 flats should suffice. Congratulations to Shashank on the briiliant manual tracking and Akarsh on the excelent processing.